Generally speaking, I find the recent trend of athletes signing one-day contracts so that they can retire with their former team to be kind of dopey. 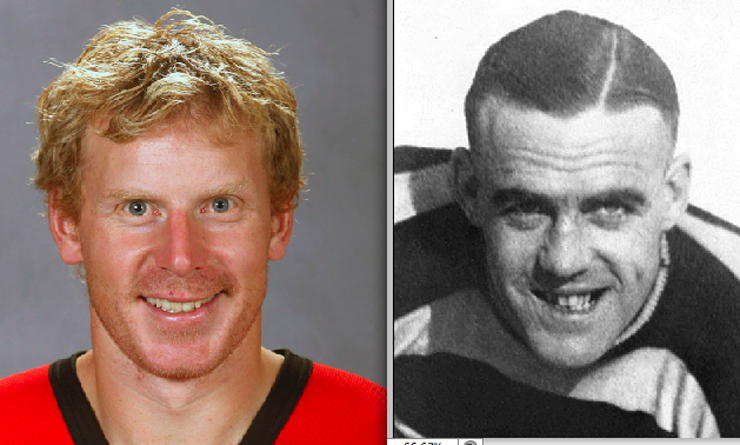 That said, I think that Daniel Alfredsson, the Senators, and Ottawa hockey fans did a real nice job of it last week. Roy MacGregor wrote a fine column about it in the Globe and Mail on Friday. I’ve enjoyed MacGregor’s writing for a long time, particularly when the topic is hockey or life at the cottage. He and I have met a few times over the years, and exchanged emails on occasion, and he’s always been great to talk to. So, I sent him a note telling him how much I liked his Alfredsson story … but pointing out one historical error. But, sadly, nothing is straightforward with this story. Hoping to fine a little more proof, I did some more digging this weekend. 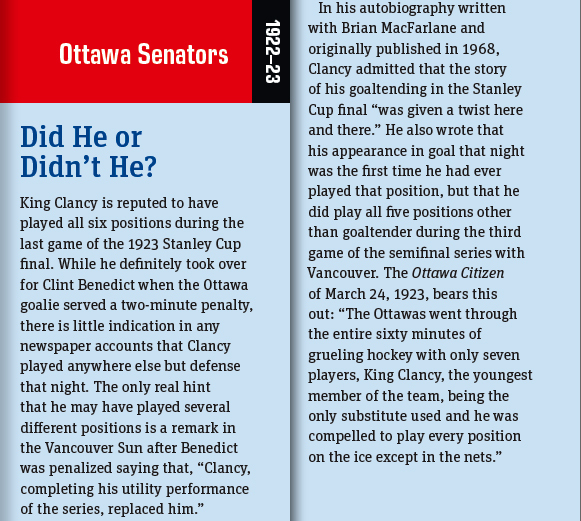 Turns out, Basil O’Meara, writing in the Ottawa Journal on April 2, 1923 after the final Stanley Cup game on March 31 had this to say: “Frank Clancy made hockey history,” and proceeds to write that, “the kid with the tousled thatch went in and played goal and tried his hand at every other position on the team.” Still, the game report on the previous page in that day’s Journal only seems to describe Clancy and Lionel Hitchman subbing in on defense, with Harry Helman taking a few turns relieving the forwards. (Maybe O’Meara’s copy editor back in Ottawa transcribed something incorrectly in type-setting the telegraphed story from Vancouver?) The Vancouver World says nothing about it. So, I still think I’m probably right in what I wrote … but I’m not quite as sure as I once was! Great stuff, Bear…….and great comment Barbara! I enjoyed this very much but admit I was half expecting a story about poor Jonathan Bernier, who I guess is understandably far too busy stopping pucks than boning up on South African history. I can see where this one would be particularly appealing to you, Bob! I remember hearing all about King Clancy playing all postions but not in one game…stories have a way of being re-written over time tho’. I knew a lady with an Irish Setter when I was 10 yrs old (back in Hamilton) who had named her dog King Clancy…now THERE was a hockey lover!